Why E-Coat? : Dearborn Deuce, Premier manufacturer of an all steel 1932 roadster body with a fully disappearing convertible top. Many of you have asked us if it is possible to have the body E-coated. Building a Dearborn Deuce Convertible TM represents a significant investment and protecting that investment from corrosion is a major concern for all of us. As your body is being assembled by a major Detroit OEM using advanced OEM jigs and equipment, it is only fitting that we offer you OEM corrosion protection. In order to dip our body in an E-coat bath, you must have at least three separate tanks large enough to handle the body and a robotic conveyor and crane system to manage the flow of work. Why three separate tanks? The first tank is used to clean and pre-treat the body, the second tank is used to apply the E-coat and the third tank is used to rinse and recycle excess material. In addition, the facility must also have a baking oven large enough to handle the body. We found such a facility in Toledo, Ohio that does specialized work for Ford’s pickup truck program. Toledo is a long way from Detroit and the transportation costs are significant. Nevertheless, we are offering a program that should satisfy everyone interested in achieving the ultimate standard in corrosion protection: the passenger and driver’s side doors, deck lid and the tonneau cover (all of these panels have an inner and outer skin), and full immersion of your body in an E-coat paint bath. The cost of this option is inclusive of “white glove” handling and transportation to and from Toledo, Ohio, special crating and fixturing and all additional labor costs connected therewith. Cost $2,500.00. E-Coat is an electrically-applied paint coating. It is also known as electrocoating, electronic coating, electronic painting, and electro photo coating. E-coating was developed originally for the automotive industry because it is economical and provides superior coverage, adhesion, and corrosion resistance. It coats any metal (aluminum, zinc, brass, steel) that conducts electricity. 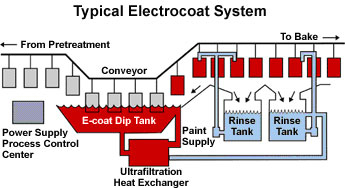 Here is how E-coat works. The parts to be E-coated are first cleaned and treated with a zinc phosphates conversion coating. The panels of your Dearborn Deuce Convertible TM are moved to Oakley’s assembly area with a thin film of oil remaining on each panel from the stamping operation. The oil protects the freshly stamped steel panel from rusting during shipping and assembly. The parts to be E-coated are then attached to metal racks or placed in a coating fixture. In our case, both the hemmed components and your Dearborn Deuce Convertible TM body each use a special coating fixture that is lifted by crane and put onto a conveyor carriage system. The bodies are placed on a system designed to carry truck frames. The parts are immersed in an E-coat paint tank. A direct negative electrical charge is applied to the carriage and the body and parts are “electrically charged.” An opposite direct positive electrical charge is applied to the paint bath. For those of you who love the details, this process is known as cationic E-coat and is used to provide a more corrosion-resistant film than the more common anionic E-coat process. The paint bath is filled with Cathodic Epoxy PPG 8000 E-coat. Epoxy based E-coats are used in environments where corrosion protection is paramount. Your “charged” parts attract the oppositely charged paint particles. As the paint is deposited it begins to act as an insulator and deposition slows, stopping at a precisely predetermined thickness that is governed by the amount of voltage applied during the process. Even though deposition may have slowed or may be complete on one area on the surface of the part, deposition will continue on any uncoated or incompletely-coated area of the part until complete coverage is achieved. This is a very important point, especially when a hemmed part is involved. For example, the doors, deck lid and tonneau cover on your convertible have an inner and outer skin. Once the part is hemmed (joined together), conventional spraying obviously cannot reach the inside surfaces of the outer or inner skins. Think about the inner door of a convertible when it rains. No matter how tight a seal is applied to the window glass, some moisture will always seep into these openings. Small hardware parts such as mounting and tapping plates as well as door and deck lid hinges are often treated as an “after thought,” but these items are especially vulnerable to corrosion and need to be protected. When a part is dipped in an E-coat bath, the E-coat is electrically drawn through the drainage or weep holes and other openings in the hemmed parts and adheres to the inside surfaces. This adhesion process will continue until the entire interior surface is uniformly coated. Conventional spraying of the most advanced primers leaves uncovered areas and over time, rust and corrosion can occur. In addition to your convertible’s hemmed parts, there is another very important area that should be treated---the inside of the square tube sub-frame components. Your convertible’s steel body panels are attached to an inner sub-frame made from square steel tubing. Conventional spray techniques can only reach a few inches inside the very end of the tube. The E-coat dipping process will cover the entire inner surface of each tube with a protective coating. After your parts are coated, they are rinsed, and any undeposited paint solids are reclaimed and recycled. The final step is to cure the E-coat by baking. Your parts are taken by the conveyor system to a baking oven for 20 minutes. Heat treating causes the molecules of the paint film to crosslink, which further adds to its strength and durability. As you can see, the very nature of the E-coat process produces a complete and uniform protective coating. We have specified matte black E-coat as the most appropriate color for your body. As a protective coating, E-coat is an increasingly popular alternative to other protective coatings such as electroplating, lacquering, painting, anodizing, and powder coating. Cosmetic Appeal. E-Coat paint applies a super-even finish, no dripping, no pooling and no gaps. Corrosion Protection. All parts are coated evenly inside and out. Complex parts can be coated even after assembly. Unbeatable Durability. Withstands the most rigorous salt spray, adhesion, dialectric, acid resistance, and U.V. tests. Super Adhesion. Because of the very nature of the E-Coat process, a thin coat can be complete, uniform, tough, and attractive, while still maintaining close engineered tolerances. E-coat is standard OEM practice: it is corrosion-resistant, chemical-resistant, temperature-resistant and U.V.-resistant. E-Coat is much more effective than even currently available etching primers. Traditional spray techniques cannot compare to the quality and durability of an E-coat primer.